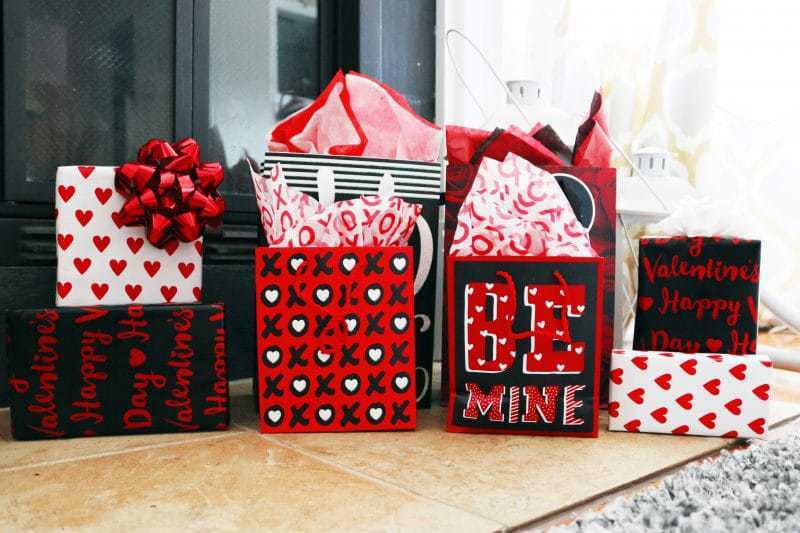 Looking for easy DIY Valentine decor ideas? 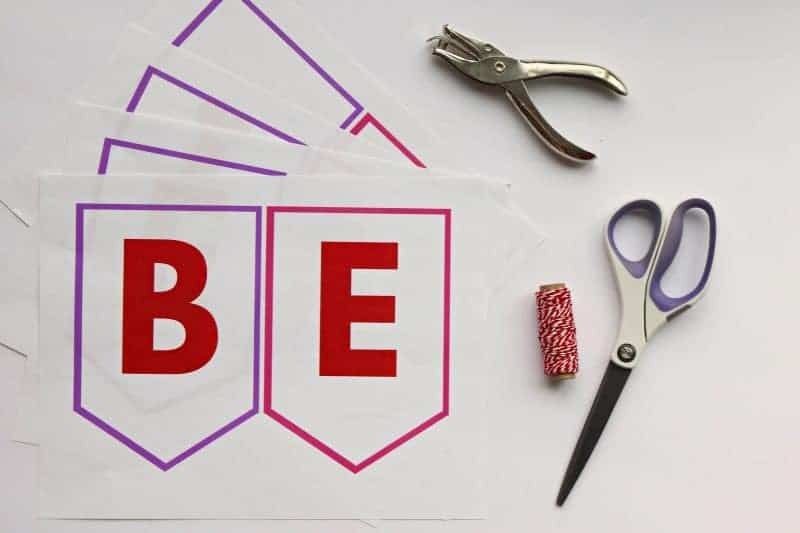 The “Be Mine” Valentine banner printable included below is perfect for hanging across your mantle or wall! Pair it with some American Greetings cards and gifts from Walmart and you will be all set for the big day! While I look forward to Valentine's Day every year, this year I am extra excited because it will be my son's very first Valentine's Day! To help celebrate I am decorating the mantle for Valentine's Day and getting our cards and gifts ready. I don't think of Valentine's Day as a purely romantic holiday. Instead, I think of it more as a day to celebrate love. I want my “boys” — my son and my husband — to know how much they are loved. I have presents for my son, presents for my husband, plus presents from my son to his daddy. In fact, I couldn't even wait until Valentine's Day to give my little guy one of his gifts. I ended up letting him open one early. Of course, in typical baby fashion, he was way more interested in the tissue paper and card than the actual toy! 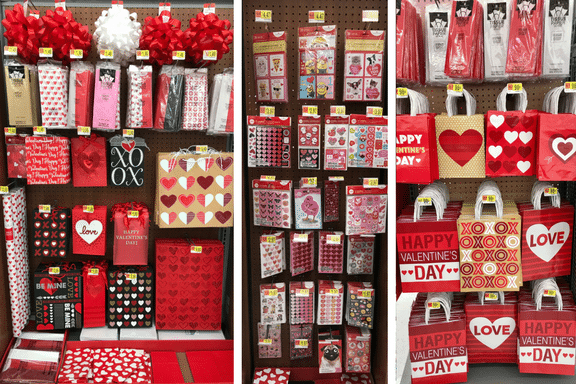 When it comes to Valentine's Day cards and gifting supplies, American Greetings Cards at Walmart has it all. 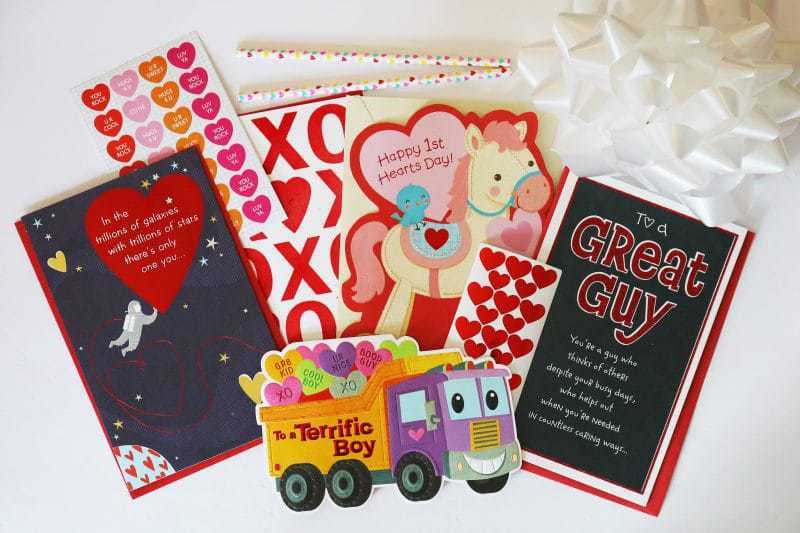 From bows and gift bags to cards and stickers, Walmart is stocked with loads of fun American Greetings products. It really is a one stop shop for all your Valentine's Day needs. 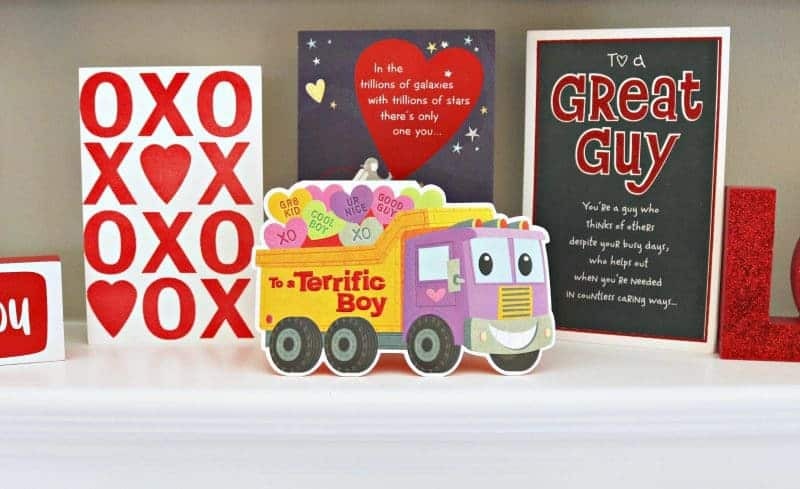 I really love the variety of cards that American Greetings cards at Walmart has, ranging from romantic cards to fun and playful cards. The selection made it easy to find the perfect card for everyone on my list. I was able to get loads of goodies perfect for my little guy and my husband from the American Greetings collection at Walmart. Just look at my haul! 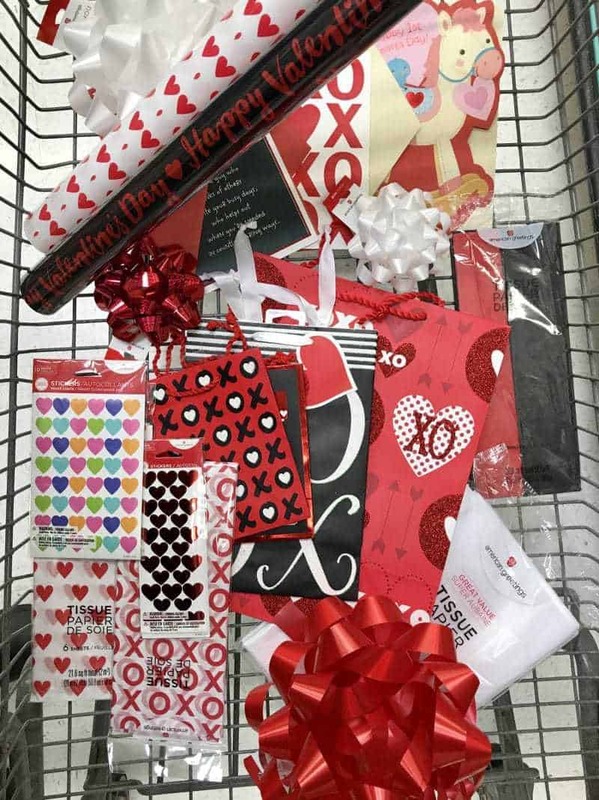 I stocked up on Valentine's Day cards, stickers, both small and large bows, tissue paper, wrapping paper, and several different sizes of gift bags. 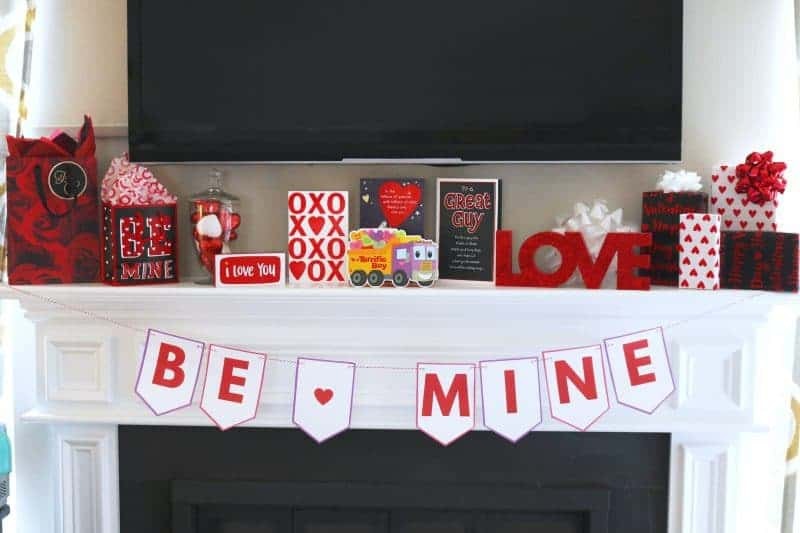 The wrapped gifts looked so festive and beautiful that I decided to display them along with my other Valentines decor on our mantle. 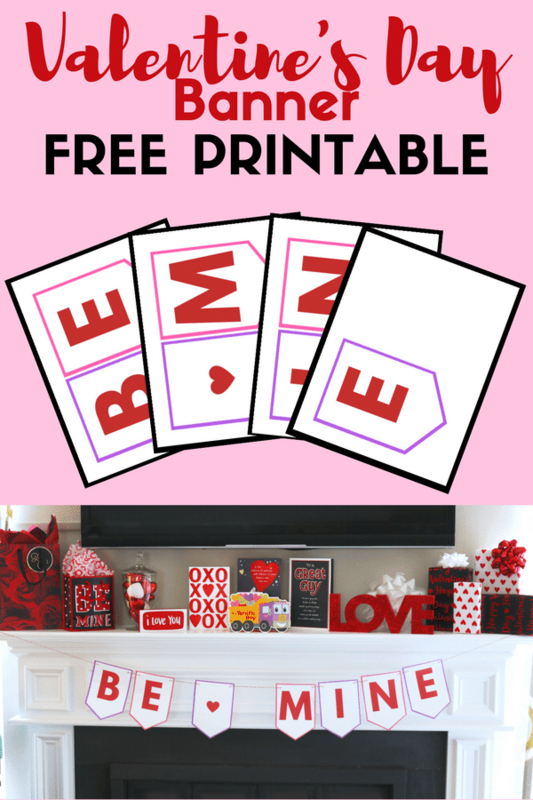 Paired with my printable “Be Mine” banner, I think that we are all set with our Valentine's Day decor. 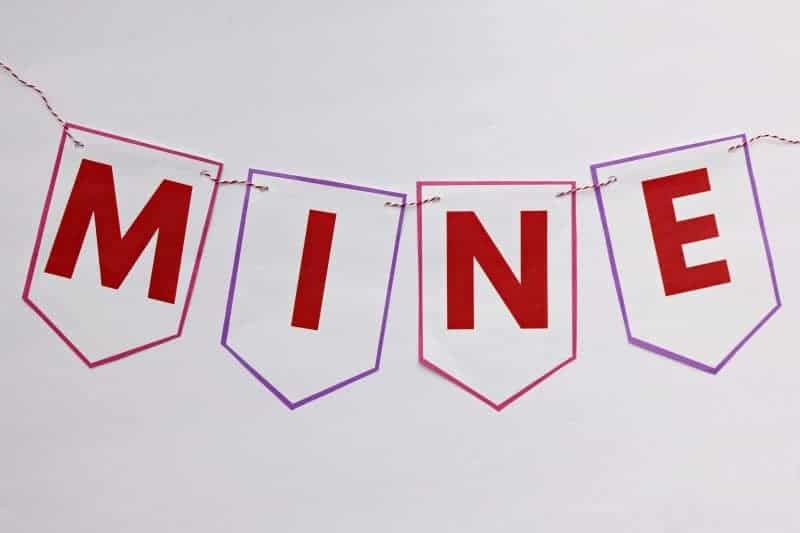 I designed a bright and colorful Be Mine printable banner to hang across our mantle to give it a fun and festive Valentine's Day look. 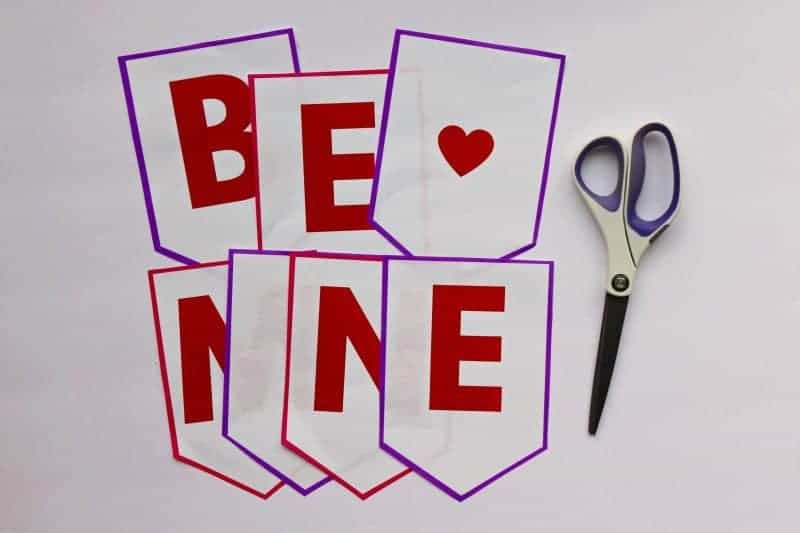 Follow the simple instructions below to make this fun DIY Valentines banner for your home. 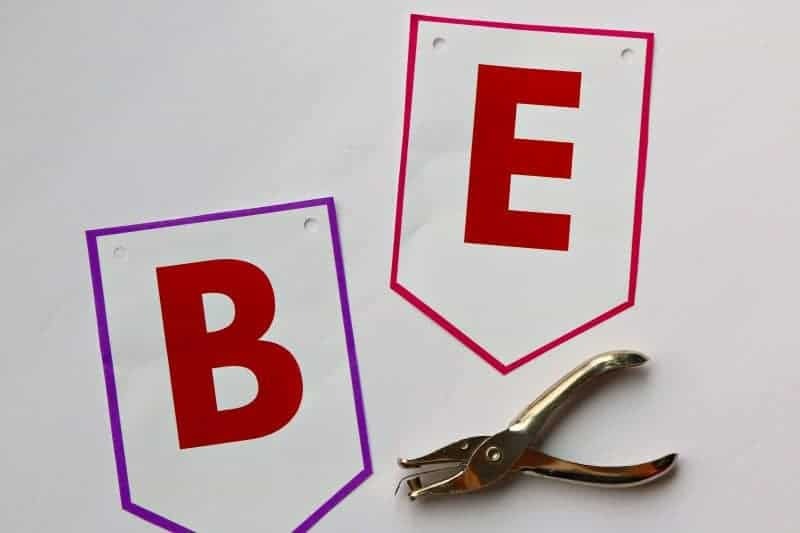 First, cut out each letter flag from the Valentine banner printable. Next, use a hole punch to make a hole near the top 2 corners of each piece. 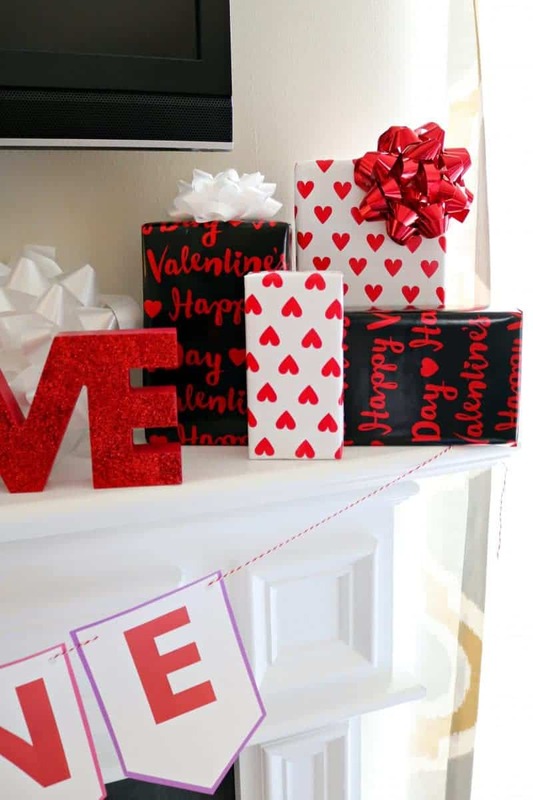 Finally, string each piece onto twine (or ribbon), hang your Valentine banner up and enjoy! Don't forget to celebrate love this year with Valentine's Day cards and gifts for your spouse, children, and other relatives, as well as cards from your kids to their grandparents, aunts, uncles, and teachers. It really is the perfect day to let the people in your life know how much they mean to you! 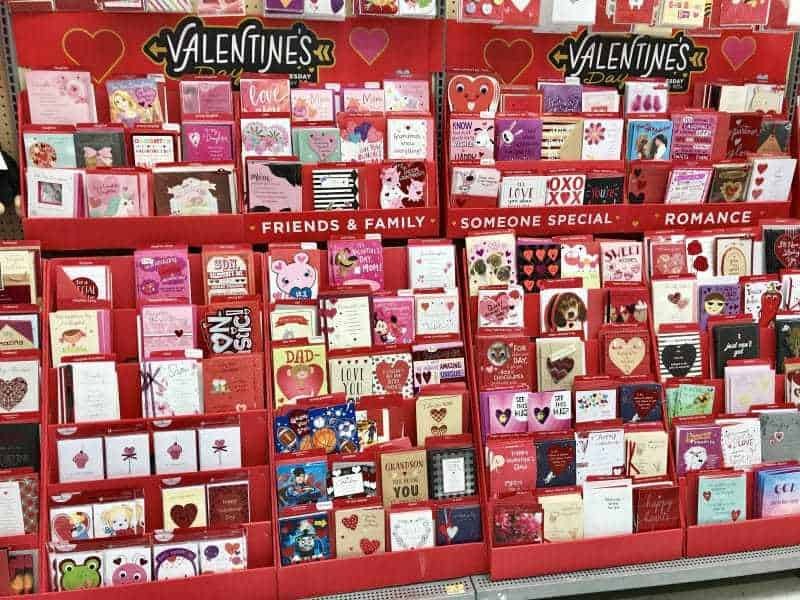 Check out the huge selection of American Greetings products at Walmart to pick up Valentine's Day cards and gifting supplies for everyone on your list. 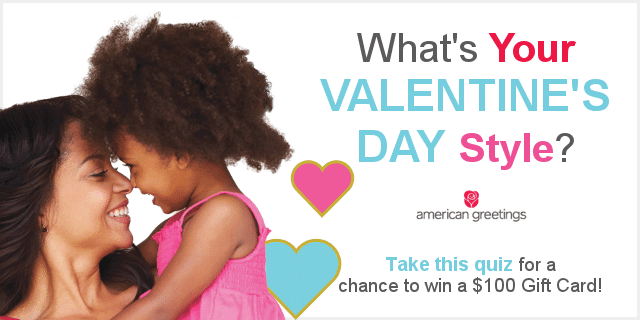 Plus, click the image above to take a fun Valentine's Day style quiz for a chance to win a $100 Gift Card! Sweepstakes ends 2/13/18. Get the official rules here. 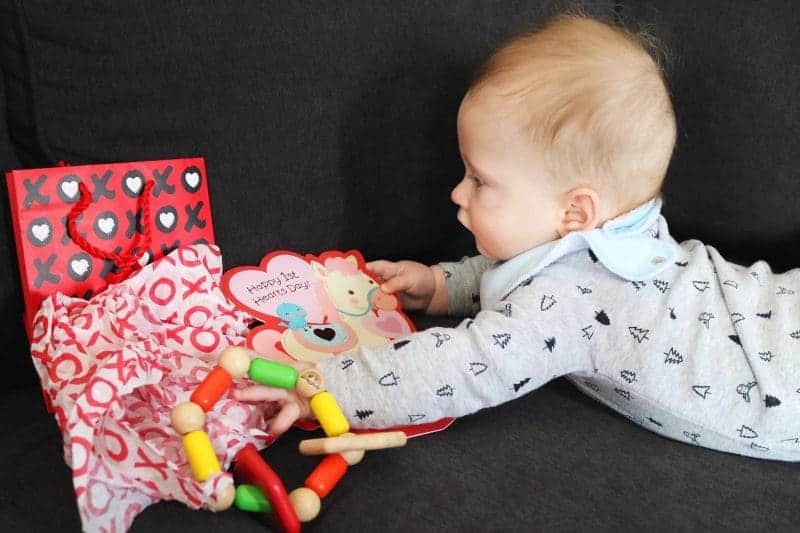 I hope that you enjoyed a peek into how I am preparing for baby's first Valentine's Day, as well as the fun printable Valentine's Day banner. Have a very happy Valentine's Day! Who is your Valentine this year? Let us know in the comments below! I love this banner! It turned out really good. I love making Valentine’s items like these. I have to say that your son is so cute too! Nice inspiration for valentine’s day. Along with your banner, I particularly loved those greetings cards at Walmart. It becomes so difficult to choose that special greeting card when they are loaded in hundreds. Loved this banner! Nice little thing to make for the pictures of kids celebrating. I’m saving this to use as a school prop next year.